The non-intercooled S54 VT1-475 supercharger system produces 470hp SAE (475DIN) and 330lb-ft of torque at 6.5psi of boost. 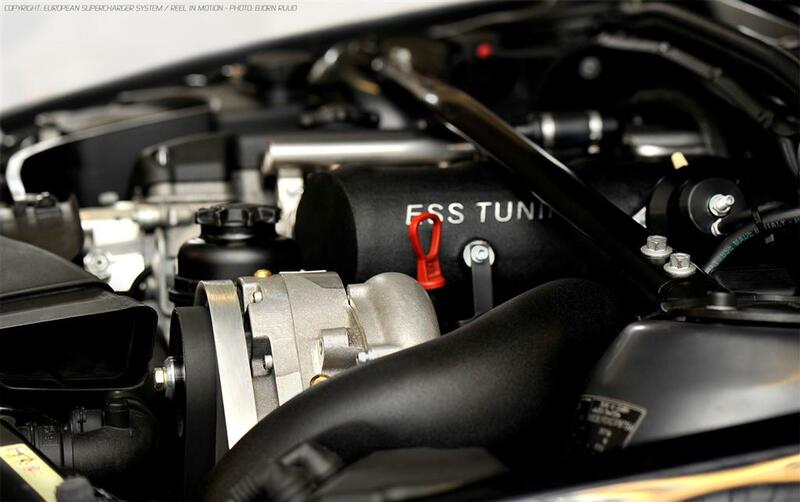 A 132hp gain over stock, eclipsing the output of a Mustang BOSS 302. Featuring the highly efficient and very reliable, self contained Vortech V3 supercharger unit in Si trim, the supercharger is capable of producing up to 775hp. The VT1-475 comes with a specially developed cast aluminum intake manifold assembly with an integrated high capacity bypass valve designed not only for optimum flow, but for minimal weight to not disrupt the iconic chassis balance of the M3. The VT1-455 is a complete system with everything you need and is easily upgradeable as all the major hardware components are the same all the way up to our VT3-700. The supercharger system includes the ESS E-Flash OBD2 cable and specific ESS engine software that is perfectly calibrated for the VT1-475 supercharged engine providing optimum ignition timing under all conditions, recalibrated EGA's for quicker throttle response, recalibrated VANOS control, and perfectly optimized fuel delivery. The dyno limiter and top speed governors are also removed. The E-Flash allows the end user to upload the supercharger ECU software from any PC running Windows XP or newer and includes a full diagnostic and code clearing capability. Any future ESS software updates can be received by email and loaded directly to the car. The stock ECU software will be saved and can easily be restored in the future. And like all ESS supercharger systems, the S54 VT Gen.3 kits are tested and tuned for over 50,000 street and track miles on multiple vehicles throughout the world, 60+ hours on our load dyno, full load top speed endurance testing on the German Autobahn, and final certification laps on the Nurburgring. The system maintains all OBD-II functions and it is backed by a comprehensive 2 year, unlimited mileage warranty program. This complete system is 100% bolt on and includes everything you need. Installation takes 6-8 hours using normal hand tools and no irreversible modifications to the car are necessary. -Vortech V3 Si-trim internally lubricated supercharger unit. -Cast aluminum ESS intake manifold. -High capacity bypass-valve system. -Powder-coated mandrel bent tubing -One belt driven w/self tension system. -Gen 3 improved, stronger CNC machined, hard anodized brackets -Improved 3 idler pulley belt loop design with greatly improved belt traction under extreme conditions. -CNC hard anodized pulleys. -Long life serpentine drive belt. -Oil breather assembly designed for boost. -5 layer super strength silicone hose throughout system. -High capacity, direct replacement Bosch fuel injectors. -K&N cold air intake located inside front bumper. -ESS E-Flash reprogramming and diagnostic interface -Perfectly optimized, dyno tweaked MSS54/MSS54HP ECU software with removed top speed governor. -Detailed and illustrated installation manual. -2yr./unlimted mileage warranty. -100% maintenance free operation. The VT1-475 requires the use of 95RON and above fuel quality.